LITTLE ROCK — The Trans-Pacific Partnership, a proposed trade agreement that would link the United States and 11 other Pacific rim countries, would provide access to Asia’s rising middle class for U.S. exports, the nation’s chief agricultural negotiator said this week. 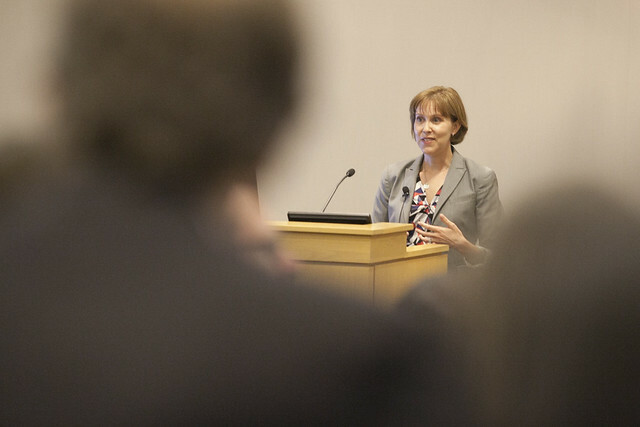 Ambassador Darci Vetter of the Office of the U.S. Trade Representative spoke to an audience of about 50 at the University of Arkansas at Little Rock William H. Bowen School of Law on Tuesday. The event was co-sponsored by the National Agricultural Law Center, a unit of the University of Arkansas System Division of Agriculture. Vetter also spoke in support of the agreement the following day at Arkansas Farm Bureau’s Policy Summit. Vetter said that the agreement will give U.S. growers access to millions of individuals who are projected to enter the economic middle class in coming decades, a transition that is expected to profoundly affect food consumption. U.S. agriculture stands to benefit from TPP, she said. “Right now, when commodity prices are so low, and farmers are struggling, I think it’s important to remember that when you maintain and open new markets, that increase in demand and decrease in risk and cost of doing business, it puts transition costs down and more money goes back into farmers’ pockets,” Vetter said. The agreement, which was drafted in October 2015 and signed by all 12 participating countries in February, would liberalize nearly every rule and reduce nearly every tariff affecting trade between the United States and its fellow signatories, including Canada, Mexico, Japan and others. While trade agreements are already in place between many countries throughout the world, most of the existing agreements don’t address agriculture. Harrison Pittman, director of the National Agricultural Law Center, said the agreement stands to affect how U.S. growers compete with agricultural producers around the world — not just those who are signatories to the agreement. In February, the American Farm Bureau Federation published a report on the TPP, estimating an increase of about $4.4 billion in net U.S. farm income annually under the agreement. Although China is not a signatory to the agreement, Vetter said that putting the agreement into action would likely have a significant effect on future trade with the country. “The TPP won’t necessarily change China’s policies, but what it does do is create more reliable trade neighbors around China, and gives us other options when China is more fickle,” Vetter said. Addressing questions about increased competition for customers here in the United States and other North American countries from audience members, Vetter said that while the TPP may bring in competition for rice contracts with Mexico from countries including Vietnam, those countries are not likely to be able to compete with the quality of U.S. rice products. Congress is the next stop for the TPP, and President Obama has announced he intends to sign the agreement if it reaches his desk. The process is expected to take months. To learn more about agricultural policy and law, visit the National Agricultural Law Center at http://nationalaglawcenter.org/.